Talk about your school of hard knocks! A newly formed international center will study satellite collisions and the countless issues regarding what to do about the menacing growth of orbital debris. The University of Maryland's Center for Orbital Debris Education and Research (CODER) has been established to delve into the technology, policy, economic, legal and sociological issues spinning around the problem of human-made space junk. The past five decades of space exploration and utilization have created an orbiting junkyard of space debris. More than 22,000 pieces of space clutter at least 2.5 inches (10 centimeters) wide are now being tracked in Earth orbit. But there is a much larger mess of debris, with smaller pieces numbering in the hundreds of thousands to millions, that are beyond the scope of current tracking capabilities. Orbiting junk travels so fast — 17,500 mph (28,160 km/h), or more than 10 times the speed of a bullet — that even tiny flecks have the potential to damage spacecraft. Two events in recent years have greatly increased the amount of debris in orbit. On Jan. 11, 2007, the Chinese intentionally destroyed their FY-1C satellite in a test of an anti-satellite weapon, producing more than 3,000 new tracked objects. Then, on Feb. 10, 2009, the active Iridium 33 satellite and Russia's defunct Cosmos 2251 satellite smashed into each other, creating about 2,000 new tracked pieces of space junk. Space clutter is a global issue, said Marshall Kaplan, associate director of CODER. "It has come to a point where everyone realizes something has to be done," Kaplan told Space.com. "There are so many unknown unknowns … and known unknowns. Orbital debris is a massive global problem, technically, legally, politically." A founding CODER faculty has been established at the university under the A. James Clark School of Engineering. While administratively at the University of Maryland in College Park, the center is establishing affiliations with existing experts and researchers outside of the university to ensure the most effective partnerships and collaborations. "We're getting a lot of interest from industry and government agencies," Kaplan said. "We've had a great kickoff … and we're planning on our first workshop on space debris this fall at the university," he said. A goal of CODER is the development of policies, laws and space systems that will lead to the efficient remediation and control of space junk, Kaplan said. Window pit from orbital debris on Challenger's STS-7 mission in June 1983. CODER is the first academically led center established to address the full range of issues surrounding the orbital debris problem, said Raymond Sedwick, director of CODER and associate professor of aerospace engineering at the University of Maryland. 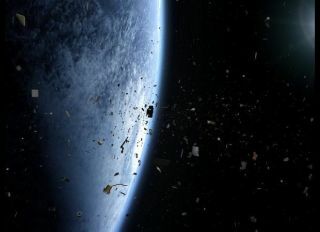 "We joke that orbital debris is a 'growth industry' without any customers," Sedwick told Space.com. There has been excellent work in tracking and modeling the problem, he said, as well as efforts in establishing policies and technologies to help slow the generation of new debris. "However, following the current trajectory, there will come a time when some of the most highly utilized regions of Earth orbit will be completely unusable due to an exponential increase in collisions and new debris formation," Sedwick said. Services that are taken for granted, such as voice communications and video broadcast — or ones that are critical to the function and security of a country — could gradually, or suddenly, be lost, he said. Sedwick said that most existing organizations focus on just one aspect of the problem — tracking, modeling, remediation, mitigation, or policy, for example — but CODER will serve as a research collective to provide expertise in all of these areas. Leonard David has been reporting on the space industry for more than five decades. He is former director of research for the National Commission on Space and is co-author of Buzz Aldrin's 2013 book, "Mission to Mars – My Vision for Space Exploration," published by National Geographic. Follow us @Spacedotcom, Facebook and Google+. Originally published on Space.com.